God has a personal vision for our lives, and He wants us to know it even more than we do. But determining Gods will can be a difficult process, especially when we need to make a decision in a hurry. 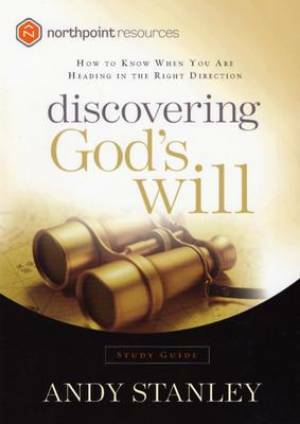 The Discovering Gods Will DVD and its companion study guide, designed for small groups or personal study, take you through the important steps of decision making, pursuing Gods will, seeking counsel from others, learning to use discernment, and understanding the mind of God through Scripture as you seek His will. The DVD includes 4 complete sermons and eight 12- to 15-minute group sessions that correspond with the study guide. The study guide, which includes a leaders guide, will help outline the amazing plan God has in mind for your life. Includes eight sessions (and a leaders guide) that will outline the amazing plan God has for your life. Discovering Gods Will Study Guide by Andy Stanley was published by Multnomah Publishers in July 2004 and is our 47754th best seller. The ISBN for Discovering Gods Will Study Guide is 9781590523797. Be the first to review Discovering Gods Will Study Guide! Got a question? No problem! Just click here to ask us about Discovering Gods Will Study Guide.